What is the Community Planning Academy? The Community Planning Academy (CPA) is a free educational program accessible to any resident who is interested in learning more about the role planning plays in building communities. CPA's program is an annual two-week course that provides an introduction to community planning, transportation, zoning and the development process. CPA's goal is to empower residents with a better understanding of community planning so they can effectively engage in planning efforts both in their neighborhood and the city. Who is the CPA course for? 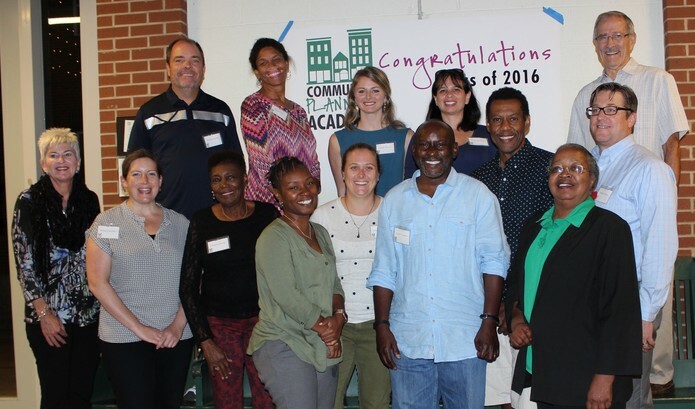 ​The Community Planning Academy is for anyone who cares about their community! Whether you've been involved in your neighborhood for years or you're a new resident – if you want to make a difference in your community CPA is for you. CPA offers residents a greater understanding of the role planning plays in building communities, and empowers them with the knowledge of how and when residents can be involved in planning processes. What planning is; what it can and cannot do. How plans are developed and put into action. How you can be involved in future planning efforts. Participants will also have the opportunity to make connections and build relationships with both Charlotte Planning Design & Development staff and other residents from across the city. The program is open to all residents but the class size will be limited to 30 seats. Admissions will be based on including a mix of residents from diverse backgrounds, from different neighborhoods, and with a range of planning experience. Applications are available here or at the bottom of the webpage. The application deadline is February 28, 2019. Staff will notify applicants of admission decisions March 12th. Please consider the time commitment before applying to the program. All classes will be held at the Powerhouse Studio on Camden Road in SouthEnd.